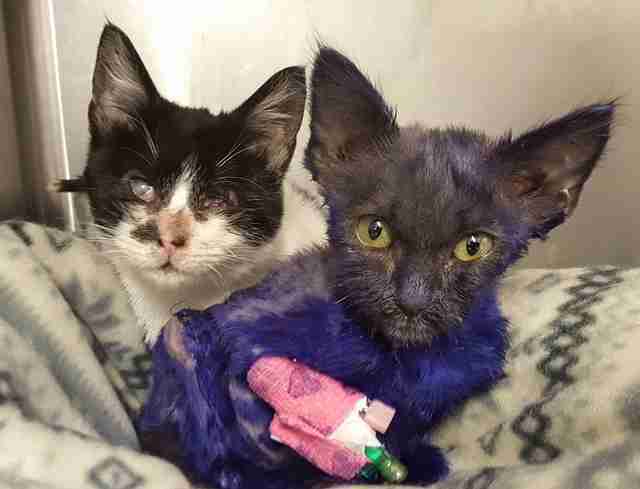 A little kitten named Smurf, who was rescued last month after being dyed purple and likely used as a living chew toy, has found a new best friend. Together, they are sharing more than just a long road to recovery. Just days after Smurf was taken in by the Nine Lives Foundation, a rescue center for injured and abused felines in California, the group saved another kitty with serious injuries - a cat named Wanda. She had been found shivering next to a garbage can, her left eye crushed and the right suffering from an infection leaving her blinded. In that darkness, though, she found a companion. "She was placed in the same cage as SMURF on her very first day and has become bonded with him," the Nine Lives Foundation wrote on Facebook. Over the last few days, the pair has shown signs of improvement thanks to the expert care of their rescuers and also the steady companionship they're receiving from one another. Their snuggling has been so constant, in fact, that Wanda has actually picked up some of the purple dye someone had poured over Smurf - a stain of cruelty transformed into a mark of friendship and solidarity. There's still no telling when Smurf and Wanda will be well enough to be adopted out to a loving home, but those caring for them say that when that day comes they'll be adopted together. The Nine Lives Foundation relies on the public's help to save the lives of animals, so consider making a donation to their cause. You can also keep updated on Smurf and Wanda's progress by following the Nine Lives Foundation's Facebook page.